How do you produce and publish IATI files when you have more than a handful of projects? And when the information is spread over multiple systems? 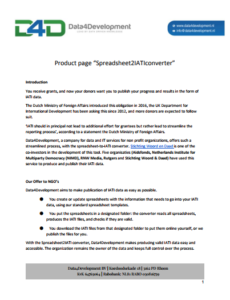 We’re now offering a “Spreadsheet to IATI service” to help you with that. We have dozens of projects: copy-pasting information into an online tool is not doable, and even preparing and uploading spreadsheets for each project is a lot of work. We have different systems for bookkeeping and for project management. And we don’t have a Monitoring and Evaluation tool yet, we use spreadsheets. We are switching IT systems, and re-organising our internal structure, and the new system is not ready yet. But we still need to update our IATI data. 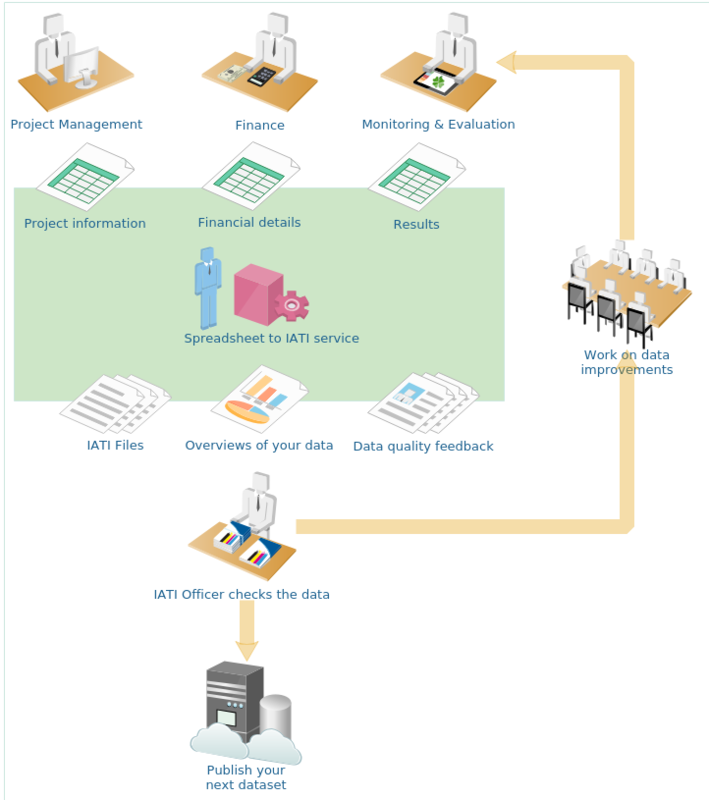 We don’t know what’s in our IATI file and whether it is correct: our tech person says it looks ok, but how can we check the data with our project staff and management, to get sign-off before we publish? If any of this sounds familiar to you: since the end of 2016, we have been developing a solution for this. In May 2017, we launched the service with Woord en Daad in The Netherlands. Several organisations are now using our “Spreadsheet to IATI service”. Think of it as your accountant or payroll service: for each quarterly or monthly update, you provide the raw information, and we compile the IATI file (and if you like: publish it for you). Maybe you have dedicated application managers who can create a suitable report from your project management system. Your bookkeeper provides overviews of the financial situation. And you have separate spreadsheets to keep track of your logical framework and result indicators. You want to combine all the information in your IATI data file. And you want to know what’s in the data before you publish. You want to make sure it meets the requirements of your donors, your partners, and your organisation. You want someone to advise you about the best way to structure your information. Or to help you reap the extra benefits of having your data in a standard format. And you certainly don’t want to figure out all the details about IATI or XML (and keep up with its new developments). You provide spreadsheets with information that needs to go into your next publication: exports from your project management system or financial system, or spreadsheets maintained by your departments or programmes. Almost everyone in your organisation already knows how to work with spreadsheets. You can add extra information or use colours to help your staff make sense of it. We have standardised spreadsheet templates, and we can work with you to develop spreadsheets that work for you, based on the systems you use. We use the “meta data” in the spreadsheets: if you format something as a date, your spreadsheet can tell us the “@iso-date”, you don’t have to. Right now, we share a Google Drive folder with you: just upload or synchronise your files there, and we can quickly create an IATI file from that. A data quality report informs you about possible problems with the data: maybe there are errors that make it an invalid IATI file, and most likely there are ways in which you could improve information about your work. Data summary spreadsheets give you an overview of how much information you provide: number of result indicators per activity, and so on. A presentation of each activity helps your staff check what is being published, before it is published. (Premium) If you have an exclusion or publishing policy (for instance: organisations you don’t want to publish about), we can add additional checks to the data quality report. (Soon) Historical overviews let you compare your new publication with the current data: a summary of what is added and what is deleted. All of this is available via a (private) website for you and your staff. You check the feedback: maybe a department forgot to approve new results or expenditures for publication? Maybe the numbers don’t add up? Maybe there still are errors in the data? You can choose to “go back” and fix your source information: then do another export, check with project staff, get sign-off from managers. After you updated your spreadsheets, we do another transformation, and the cycle continues. Ready to publish your new data? We provide you with an “error-free IATI file”: all activities that still have errors are filtered out. At the minimum, that’s free of “IATI-technical” errors: your data will “validate according to the schema”, and (soon) according to the documentation and practices established in the IATI community. If your donor has additional requirements, we can incorporate those (soon: the guidelines of the Dutch Ministry of Foreign Affairs will be completely included). (Premium) Activities with errors according to tests based on your exclusion or publication policy can be excluded as well. We can also publish the file for you, and if you like, manage your IATI Registry account for you. You focus on your work processes, reporting workflows, and information systems. We help you make those processes, workflows and systems IATI-proof. We take care of producing your IATI data for you. And you or we then publish that IATI data. Posted in Aid Transparency, News, Open data, Tools.